In Japan, Irezumi (tattoos) are strongly associated with the Yakuza. However, outside of Japan, they are highly regarded as pieces of fine art in photo exhibitions for example. How has the tattoo developed in this way and what has caused this negative image? Furthermore, what does the future hold for tattoos? What are the main differences between Western tattoos and Japanese tattoos? In contrast with Western tattoos, where one symbol or image acts as the main focal point, Japanese tattoos can cover the back, the entire arm and sometimes even the whole body. The style of covering the whole body is deeply intertwined with Ukiyo-e, the traditional art which Japan proudly introduced to the world. 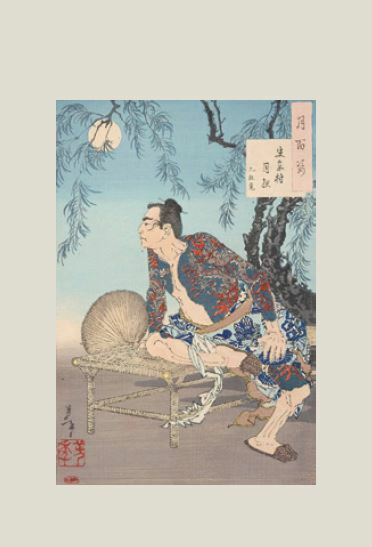 In the Edo period in the middle of the 19th century, Ukiyo-e painter Kuniyoshi Utagawa released a series of Ukiyo-e prints based on the themes in the Chinese novel, “Water Margin”, which became popular in Tokyo. As this tale was already well-liked, Kuniyoshi Utagawa’s dynamic method of creating these prints was enthusiastically accepted by the people of Edo just like a famous contemporary movie would be today. Many of the characters in these Ukiyo-e prints had tattoos and one of the most popular characters featured a tattoo of 9 dragons on their back. People who loved the “Water Margin” ukiyo-e prints and other works by Kuniyoshi then used these characters and paintings as a base when getting their own tattoos drawn. It should also be noted that it wasn’t the Yakuza who originally liked tattoos, it wasthe regular citizens of Edo, such as firefighters and couriers who would remove their clothes during the course of their work. Due to this, Irezumi and Ukiyo-e flourished as part of the day to day culture and life of Edo’s town folk. However, it was not Japan that first sawn Irezumi as a work of art but the West. In fact, amongst the foreigners who came to Japan at the end of the Edo period or after the Meiji restoration, there were a number of royal officials who were attracted by the beauty of Irezumi and got them drawn as a memory of their visit, as well as Britons who studied the art and then became famous tattooists upon their return home. Like ukiyo-e, the tattoos were seen in the eyes of foreigners as an exotic part of Japan’s beauty. WHY ARE IREZUMI CONSIDERED TABOO? How did something which was a mainstay of the people of Edo’s culture become seen as a symbol of the Yakuza and taboo in Japan? One of the reasons was that the Meiji government put a ban on the art. After the country opened up by way of the Meiji Restoration, the government of the day wanted Japan to be a civilised country in line with European countries and the United States. Some foreigners regarded irezumi as barbaric so legal restrictions were imposed on tattoo engravers and their customers. That regulation continued for more than 60 years until Japan was defeated in World War II and the newly enacted Japanese Constitution came into existence. continued working and, from that underground setting, the image of tattoos being thought of as “illegal” and “anti-establishment” was born. Then in the 1960’s, a large number of Yakuza movies started to be produced and this gave real impetus to further develop the idea of “Yakuza = irezumi” as an overt image. In fact, in the 30 years which spanned from 1963 to 1993 there were 1,057 Yakuza movies produced in Japan and the majority of the main characters had tattoos. It was not only the movies, but also their publicity posters which featured the inseparable images of Yakuza and tattoos and it’s thought this also left a very strong impression in the minds of everyday folk. Illegality was another reason why tattoos remained hidden. Even after they became legal, the media continued through movies to portray them in a sinister way and this may have contributed a lot to the notion of “irezumi = Yakuza”’ which still exists in Japan today. Following that, from the 1990’s until present day the styles and shapes of western tattoos began to permeate Tokyo and these tattoos became a part of youth culture. Yet in public bathhouses and in new places like beaches and pools, widespread pressure to enforce regulations and forbid tattoos continues to build. The existence of the Yakuza has also become threatened due to the influence of the Anti-Organized Crime law and the custom of paying a high amount of money for new tattoos is decreasing rapidly. Even if we start to break from the status quo, the image of irezumi being associated with the Yakuza and evil remains firmly rooted in people’s consciousness. Conversely, the concept of irezumi being acknowledged as art is gaining strength in many developed nations outside of Japan. In the United States, for example, there are travelling roadshows which showcase this while in Australia, there are exhibitions which focus on the art of tattoo photography. Even though the art was born in Japan, the perspective of recognising it as something associated with wrongdoers instead of considering the artistic value is unique to the country. In 2020, the Olympics will be held in Japan. As one can imagine, there will be a lot of athletes with tattoos coming to Japan as well as tourists visiting from foreign countries. The Japanese government is trying to welcome these people, but at present in public bathhouses for example, measures requiring all tattoos to be covered by a patch still remain in place. Despite the differences of opinion regarding the appreciation of tattoos as art between Japan and other countries, will the view of them as a “Yakuza symbol” one day diminish and will they ever be accepted as a form of art in Japan? THE TRADITION OFJAPAN CAN ALL BEFOUND CONDENSEIN FULL BODYSUITS. 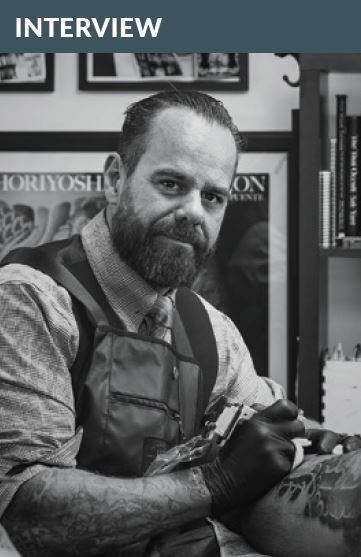 Starting out as a tattoo artist in his home country ofCanada, Kian’s passion for Japanese culture steadily drew him into the world of Japanese tattoos until, after many long years of practice, he was awarded an honorary name as a traditional Japanese tattoo artist. Kian now runs a tattoo shop in Sydney where he passes on the ancient art of wabori right here in Australia. The location is Surry Hills, one of Sydney’s inner-city neighbourhoods lined with traditional, Victorian-style houses. Here, in the room of a large multi-tenant building can be found Kian’s tattoo shop – Authentink Studio. As you open the door, you are ushered into a world of its own where a row of workstations set up like simple beds host nine to ten artists working quietly to create colourful art on the backs, arms, and You will find no seedy atmosphere in this studio with its high ceiling and clean facilities. Rather, it looks almost like a high-end massage parlour at first glance, but the photographs of tough-looking Japanese men baring all with their full body tattoos tells of Kian’s roots. Kian spent his impressionable teen years growing up in Toronto, Canada in the early 1980s. Like many teenagers of the time, Kian was baptised in the aggressive, monotone sounds of punk rock with its anti-establishment lyrics. The mohawks, the ripped slim jeans and worn leather jackets all led to an interest in tattoos as an aspect of punk fashion. After training and homing his skills in Canada, Kian moved to Europe where he set up base in Spain and started working as a tattoo artist while travelling the world. Kian first travelled to Japan in the 90s, coming back once every few months thereafter to learn more about wabori while building relationships with Japanese tattoo artists. It was in 2013 that Kian was awarded the honoraryntattoo name “Horisumi” in recognition of his 20 years experience as a tattoo artist at the time. It is an extremely rare honour for non-Japanese to be awarded with such a title. Kian is now based in Sydney where he has been running a tattoo shop for four years. Paying the utmost care to the details of traditional Japanese art and techniques, Kian uses only tools and supplies such as needles, ink, and pigments that are all of the highest quality from Japan. For self-professed craftsman Kian, there is no end goal in sight.